Love, love the map with the film border!! Great idea! Me too! Not what one would normally think of. Also the “Remember When” — Ingenious! So simple but imagine not often thought of. Great Job! Thank you. Me too! I didn’t really care for the film strip cartridge until I saw this page! Wonderful ideas! Thanks for sharing!!! Love the map/ filmstrip idea! Can’t wait to try it! Me, too! Borders are a fun way to personalize scrapbook pages, and many border ideas can be translated into cards and other crafts. Love using the picket fence on two sides with the ribbon/paper woven through! Love your ideas and will use them on future pages. I entered blog from the Candian site, but cannot enter the draw – available to U.S. Only? Because of shipping costs, my giveaway is only open to those in the U.S., but the big giveaway on the CM site is open to everybody! Love the photo scraps border. What a cool way to accent a page. I love the birthday border! Thanks for sharing some cute ideas! Love the layouts! Especially the Remember When with the vintage paper. Love the map idea best but also like how you used different papers! Love the map/filmstrip idea. I will be using that. So very creative!! Love these ideas! I love anything w/ the Tangerine, Plum & Then Some papers. Glad to see an idea using the film strip. Thanks for the great ideas. I LOVE the filmstrip on the map. Perfect for some of my pages from my trip to England. 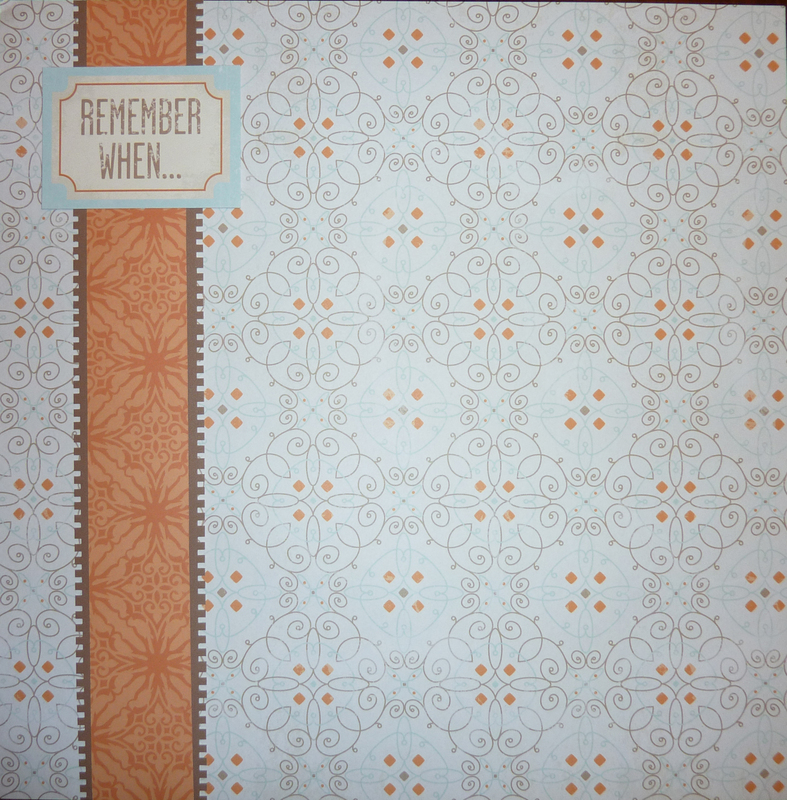 I love the “Remember When” page and the idea of using a border maker cartridge on BOTH sides of the strip! Thank you! Love your ideas. I will have to try them. Love the filmstrip & map combination! To make that border, I actually just punched the edged and not the full filmstrip width (instructions and measurements are in the instructions PDF that you can download on the page), but you certainly could do it the way you’re describing. It’s a great, versatile border! In this grouping I like the border with the Vintage paper! Great creativity! I really like the borders could do a lot of stuff with them. I like the way you incorporated the Shape Maker Circle Tag Cartridge with the Bubble Cartridge. I’m trying to promote the Shapemaker System, since I still have some on hand, and this will be a good way to do it. Thanks! The circle tag is a fun shape, and when I started stringing the punched out shapes together I really wanted to put them to good use, and then it grew into this! Great ideas! Can’t wait to try them all! Loved the Map and filmstrip and also the picket fence idea. You gave me lots of ideas. So talented! Love the map border! I really like the birthday cake one. Love all the borders! It’s wonderful to find CM lovers that are creative and inspiring! Thank you for sharing! The map and film border page is so cute!! I do a lot of vacation books and will definitely use the map idea. 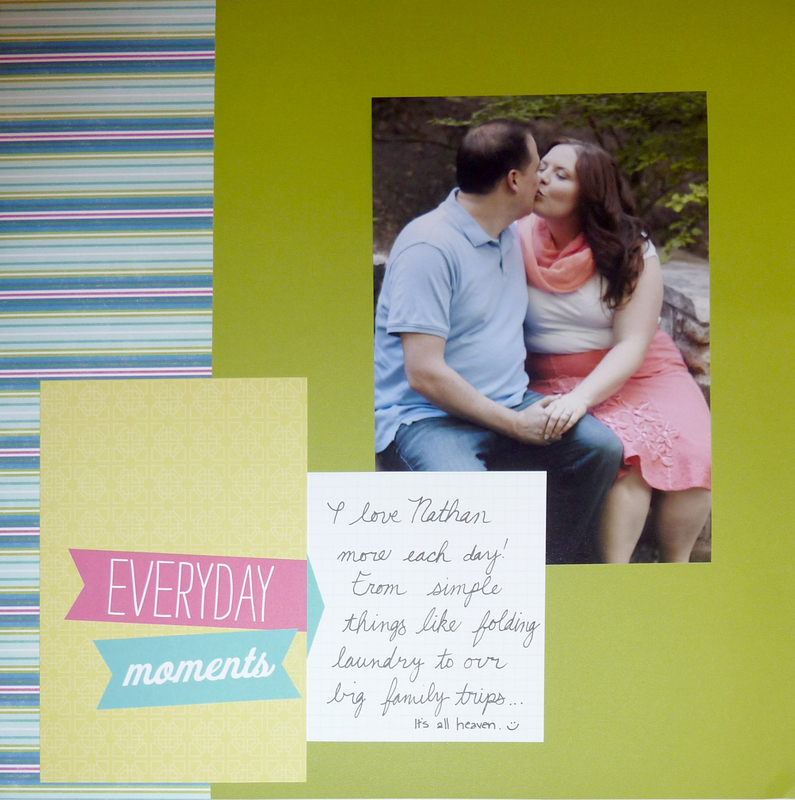 What a great way to use some photo scraps!! I love the map and filmstrip idea. Really neat way to use those scraps. Great idea to use “photo scraps” in the film strip border. Also, love the idea of using the free map from a trip as a background. I would love to use both of these ideas from my recent trip to France & London. 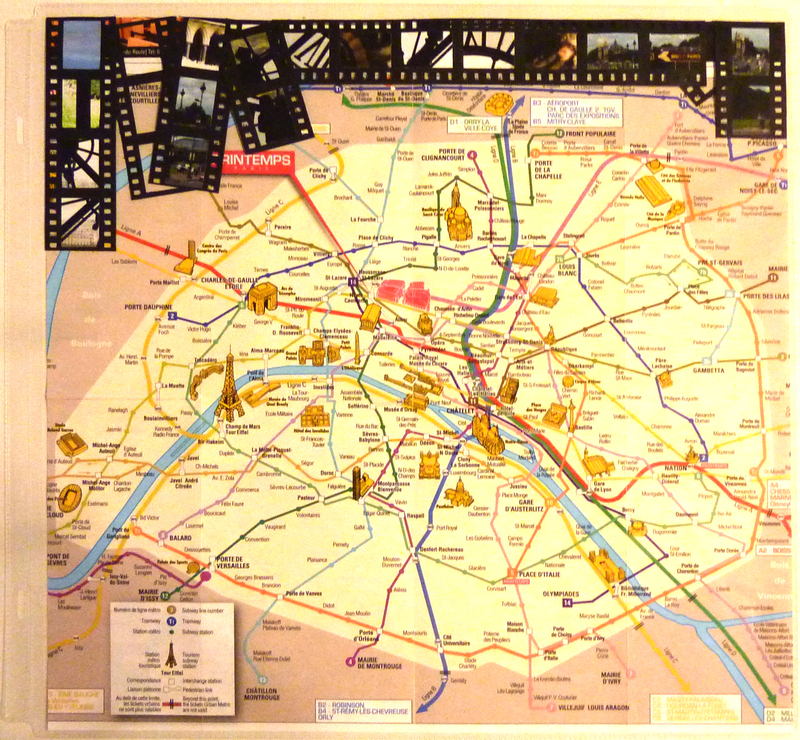 Yeah, this is a Paris map from a trip last year. 🙂 It’s my favorite European destination! I love the idea with the map and all the film strips going in different directions! Great ideas Love the all actually!!!!!!! Really liked your ideas especially the b-day cake border. You are very creative. Thank you! great idea using the film strips and map, thanks. WOW!! So many ideas. My mind is on overload. I love the filmstrip border maker used to highlight the trip. The picket fence w/ the 1/2 sheet of paper woven through it…Brilliant idea! The use of the bubble border maker to highlight printed paper under it…Awesome! I loved them all & can’t wait to place my order & combine the wonderful ideas here with my own. I WOULD THE MAP ONE. I HAVE A LOT OF VACATION PICTURES TO DO. Have loved every single idea you have provided! Please don’t stop. Thanks for sharing your ideas – the birthday and the map pages are my favorite!! I think i might try making the “cake” a solid color and make the circles multi colors for my sons birthday page!! Thanks again!! Yay! I love designs that aren’t necessarily tied to one paper or sticker. Once you have the idea and know how the prices go together, you can recreate it in a style that fits your project. The birthday border is so cute! I also love ideas using “photo scraps” and memorabilia such as the map! You always have such fantastic ideas! So cute. I love the photo scraps and film strip border on the vacation page, and the reverse use on the vintage page is really neat (and love the way all the colors come together). I can never get enough birthday page ideas. Thanks for another great one! Thanks for all the border ideas. We can never have enough……since we have so many pages that need saving for future generations.